These are not your grandpa’s sheds! Webster’s Dictionary defines a shed as a roofed structure, typically made of wood or metal, used as a storage space, a shelter for animals, tools, or gardening equipment. 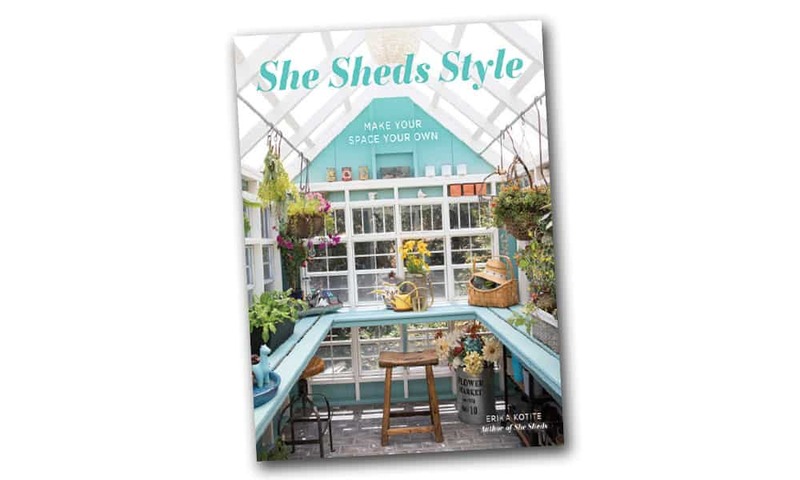 Clearly, Noah Webster never imagined the sheds author Erika Kotite included in her book She Sheds Style: Make Your Space Your Own. These are not your grandpa’s sheds. Kotite, a home and lifestyle expert, treats readers to an assortment of stunning sheds for women to use as a place to create, write, paint, or just contemplate the view from their very own space. The “she shed” craze is extremely popular. Women everywhere are designing retreats all their own in their backyards. From peaceful reading areas to craft studios, the sheds highlighted in Kotite’s book reflect the originality of those sanctuaries created by women from all walks of life. Like man-caves before them, she sheds are outfitted in complete totality to the proprietor’s personal taste. Filled with beautiful color images of those one-of-a-kind sheds inside and out, Kotite provides readers with a look at the way women are achieving a more harmonious home-life balance. Among the sheds spotlighted in She Sheds Style are the sheds of interior designer Alexis King, artist Rachael Roe, gardener Carla Fisher, and homeowner Vicki Sakioka. Each of the women created stunning spaces that include unique lighting fixtures, comfy sofas, decorative window frames, and old-fashioned desks. In addition to the interior-decorating tips and suggestions for materials to use, Kotite provides she shed plans for readers to design their own space. She Shed Style: Make Your Space Your Own is for every woman craving a special place to reset themselves. Reviewed by Chris Enss, COWGIRL Book Editor, and a New York Times best-selling author who writes about women of the Old West.